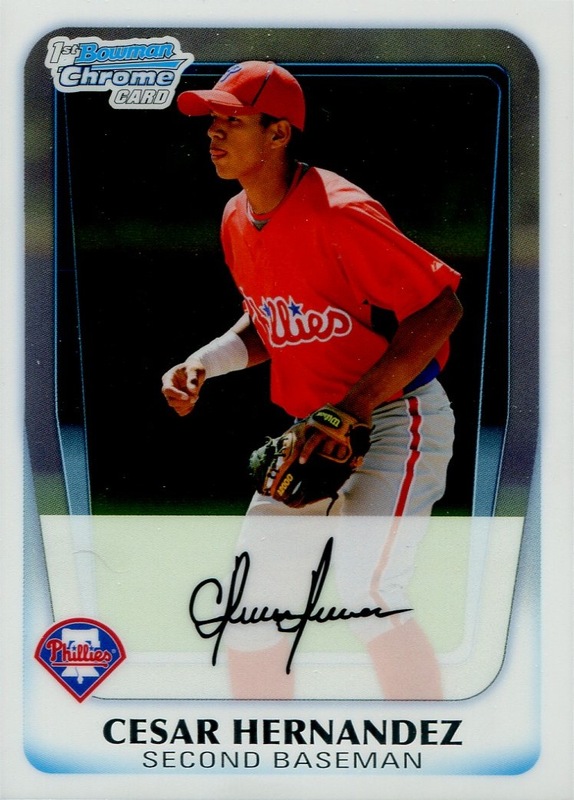 Congratulations to César Hernández for making his Major League debut last night, and congratulations to Topps for getting another prospect right — this really is a remarkably rare occurrence, at least when it comes to Phillies minor leaguers. I should really do a post sometime in which I do a breakdown all of the players to get the insert treatment and compare to the number that make it to The Show (Domonic Brown and Freddie Galvis), those that don’t (Chance Chapman and Jeremy Hamilton), and a count of those whose official MLB-sanctioned “Rookie Card” is also their very first appearance on a baseball card (Vance Worley and Darin Ruf). In the meantime, it will be interesting to see which player Topps decides to give official rookie card treatment to first: Hernández or Freddy Galvis.